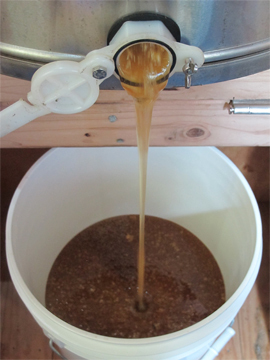 Last posting was about pulling honey at my bee yards. In my continuing “this happened about 3 weeks ago, but I’m catching up” format this is looking back on extracting that honey. 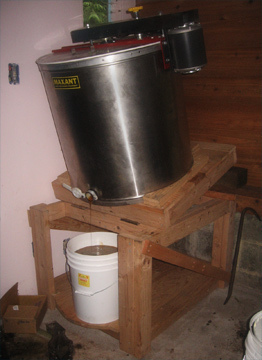 I have a very small extraction room: 8 foot by 8 foot (2.4 meters X 2.4 meters – makes much more sence in US measurements). In that space I have a 20 frame Maxant Extractor, a small table that holds my extraction tub, my bicycle (no nothing to do with extraction, it’s just kept there), and a small heater. The small size makes it easy to keep the room at 90F while I’m working. The truly cool thing about my extraction set up is the tilting extractor stand that my husband, a fabulous woodworker, built for me. You can see and read more about the extraction stand at in last year’s extraction blog. Other than that, extraction is pretty standard at Brookfield Farm. Thus more photos than anything else. 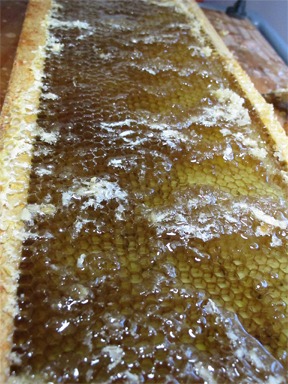 The honey was so clear that you could see down to the foundation in both the Mountain Wildflower honey and the Farm and Field honey. 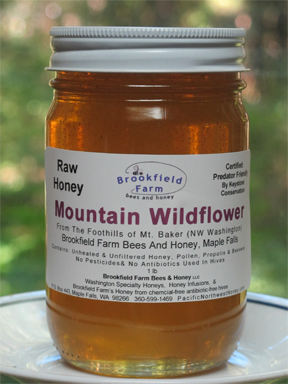 The finished up-river product : Mountain Wildflower from The Mt. Baker Foothills. That’s the excitement in the honey extraction room at Brookfield Farm Bees And Honey in Maple Falls, Washington – hope all your extraction went well. 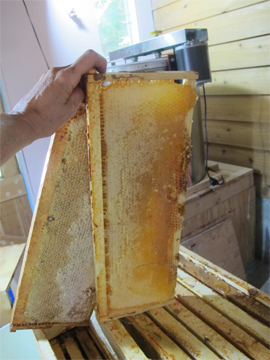 This entry was posted in Beekeeping and tagged Brookfield Farm, extraction, honey, Maple Falls, pictures, Washington. Bookmark the permalink.